Amazing story. I've listened to this story over 10 times over the years. Brilliantly done!! Chapter 47 - "The Lion's Den" Part 3 of 3 The beginning of the end... July 19th is the finale premiere in LA, and on July 21st, the finale will be available as part of our finale download pack for $5, and then streamed LIVE on zombiepodcast.com and available on the normal podcast feed July 29th. Confused? We have all the finale details posted on Zombiepodcast.com. Chapter 43 - "The Darkness Ahead" Part 1 of 3 Where do we go from here? Come back March 3rd for the next episode! Chapter 42 - "Chasing Ghosts" Part 3 of 3 What happened... Come back February 24th for the next episode! Chapter 42 - "Chasing Ghosts" Part 2 of 3 Retrieving Puck... Come back February 3rd for the next episode! Chapter 42 - "Chasing Ghosts" Part 1 of 3 Unfinished business... Come back January 27th for the next episode! Chapter 41 - "Eye of the Storm" Part 3 of 3 Where to go from here... Come back January 20th for the next episode! Chapter 41 - "Eye of the Storm" Part 2 of 3 Events long since passed... Come back January 6th for the next episode! Chapter 41 - "Eye of the Storm" Part 1 of 3 The aftermath... Come back Monday December 30th for the next episode! Chapter 40 - "Monsters" Part 3 of 3 The rain falls... Come back Monday December 16th for the next episode! Chapter 40 - "Monsters" Part 2 of 3 Where the trial began... Come back Monday December 2nd for the next episode! Chapter 40 - "Monsters" Part 1 of 3 Ink on the page... Come back Monday November 25th for the next episode! Chapter 39 - "Chemical Reactions" Part 3 of 3 Following the trail... Come back Monday November 18th for the next episode! Chapter 39 - "Chemical Reactions" Part 2 of 3 Leaving a trail... Come back Monday November 4th for the next episode! Chapter 39 - "Chemical Reactions" Part 1 of 3 Blood turns the tides... Come back Monday October 28th for the next episode! Chapter 38 - "Unity Makes Strength" Part 3 of 3 Long term commitments... Come back Monday October 21st for the next chapter! Chapter 38 - "Unity Makes Strength" Part 2 of 3 Putting the pieces back together, before tearing them apart. Come back Monday October 7th for part 3! Chapter 38 - "Unity Makes Strength" Part 1 of 3 It's hard to say goodbye... Come back Monday September 30th for part 2! Chapter 37 - "Balance of Power" Part 3 of 3 The power has shifted. Chapter 37 - "Balance of Power" Part 2 of 3 One of our survivors goes under the knife. Chapter 37 - "Balance of Power" Part 1 of 3 Season 4 kicks off with Chapter 37. Our group of survivors are back together, but the struggle is far from over. Season 3 Recap Season 3 Recap of "We're Alive" Come back August 26th for the Season 4 of We're Alive! 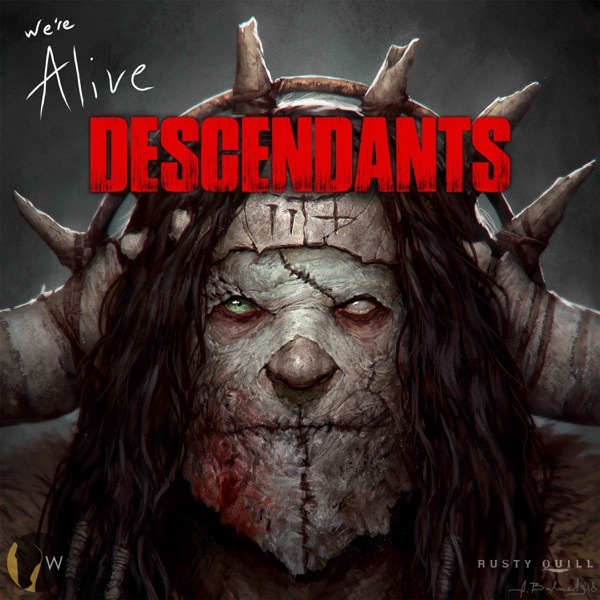 Chapter 36 - "Scorched Earth" The Season 3 Finale of We're Alive. We will return in Fall 2013. Chapter 35 - "The End is Near" Part 3 "Of our elaborate plans, the end" - Come back Dec 5th for the hour long season 3 finale aired LIVE on Zombiepodcast.com! Chapter 35 - "The End is Near" Part 2 "Desperately in need...of some...stranger's hand" - Come back Nov 12th for the next episode! Chapter 35 - "The End is Near" Part 1 "My best friend, the end..." - Come back Nov 5th for the next episode! Chapter 34 - "It Only Takes One" Part 3 "Still running..." - Come back Oct 29th for the next episode! Chapter 34 - "It Only Takes One" Part 1 "What to do next" - Come back Oct 8th for the next episode! It's NUMBER 100!!! Chapter 33 - "Red Winter" Part 3 "The view of inside" - Come back Oct 1st for the next episode! Chapter 33 - "Red Winter" Part 2 "The view from above" - Come back Sep 17th for the next episode! Chapter 33 - "Red Winter" Part 1 "Catching up" - Come back Sep 10th for the next episode! Chapter 32 - "Captive Hearts" Part 3 "Look at us now" - Come back Sep 3rd for the next episode! Chapter 32 - "Captive Hearts" Part 2 "On the Inside" - Come back August 20th for the next episode! Chapter 32 - "Captive Hearts" Part 1 "The Execution" - Come back August 13th for the next episode! Chapter 31 - "Family Ties" Part 3 "The Plan" - Due to the Live Event, We're Alive will return August 6th! Chapter 31 - "Family Ties" Part 2 "When push comes to shove" - Come back in July 16th for the next episode! Chapter 31 - "Family Ties" Part 1 "From Life, till Death" - Come back in July 9th for the next episode! Chapter 30 - "Short Term Memory" Part 3 Some things just aren't possible - Come back in July 2nd for the next episode! Chapter 30 - "Short Term Memory" Part 2 Unexpected visitors - Come back in June 18th for the next episode! Chapter 30 - "Short Term Memory" Part 1 Sometimes you don't want to forget- Due to the crew being in New York for the Audies, we're back June 11th for the next episode. Chapter 29 - "Beyond Our Walls" Part 3 Forgot something? Come back May 28th for the next episode. Chapter 29 - "Beyond Our Walls" Part 2 What we didn't know... Come back May 14th for the next episode. Chapter 29 - "Beyond Our Walls" Part 1 Unexpected consequences... Come back May 7th for the next episode. Chapter 27 - "Last Dying Breath" Part 3 Deep into Inglewood. Come back April 30th for the next episode. Chapter 27 - "Last Dying Breath" Part 2 More pressing issues... Come back April 16th for the next episode. Chapter 27 - "Last Dying Breath" Part 1 Last words... Come back April 9th for the next episode. Chapter 27 - "The Thirty-First" Part 3 Into the heart of the beast. Come back April 2nd for the next episode. Chapter 27 - "The Thirty-First" Part 2 And keep turning... Come back March 19th for the next episode. Chapter 27 - "The Thirty-First" Part 1 The pages turn... Come back March 12th for the next episode. Chapter 26 - "Who Overcomes..." Part 2 Keep moving forward, but in what direction? Come back Feb 13th for Part 3. Chapter 26 - "Who Overcomes..." Part 1 Ashes to ashes, dust to dust... Come back Feb 6th for Part 2. Chapter 25 - "Inadequate Strength" Part 3 Don't wander away from the group... Come back January 30th for Chapter 26. Chapter 25 - "Inadequate Strength" Part 2 Where to go from here... Come back January 16th for part 3. Chapter 25 - "Inadequate Strength" Part 1 Season 3 Begins. Come back January 9th for part 2. Season 2 Recap Season 2 Recap of "We're Alive" Come back January 2nd for the Season 3 of We're Alive! Chapter 24 - "The Harder they Fall" This is it... Come back in the winter for the next Season of We're Alive. - UPDATE - Episode updated with slight fix - March 2014. Chapter 23 - "The Devil's Workshop" Part 3 The only way out... is up. Come back July 30th for the Season Finale of We're Alive. Chapter 23 - "The Devil's Workshop" Part 2 No way out... Come back July 11th for the next part of We're Alive. Chapter 23 - "The Devil's Workshop" Part 1 Some things are best left alone-- Come back June 27th for the next part of We're Alive. Chapter 22 - "Our Doubts are Traitors" Part 3 Somewhere to avoid- Come back June 20th for the next part of We're Alive. Chapter 22 - "Our Doubts are Traitors" Part 2 The other side of things- Come back June 6th for the next part of We're Alive. Chapter 22 - "Our Doubts are Traitors" Part 1 Against all Enemies, foreign and domestic... Come back May 30th for the next part of We're Alive. Chapter 21 - "Mark of the Beast" Part 3 To fly? Come back May 23rd for the next part of We're Alive. Chapter 21 - "Mark of the Beast" Part 2 Trouble in the distance... Come back next Monday for the next part of We're Alive. Chapter 21 - "Mark of the Beast" Part 1 No one is safe... Come back next Monday for the next part of We're Alive. Chapter 16 - "Over the Air-Waves" Part 2 The Yacht off shore is explored while Kalani and Angel leave for an unexpected detour Come back Monday December 6th for Part 3. Chapter 15 - "Desperate Times" Part 3 Michael, Kelly, and Pegs explore their new surroundings. Come back Monday November 15th for Chapter 16. Chapter 15 - "Desperate Times" Part 2 Michael, Kelly, and Pegs embark south. Come back Monday November 1st for Part 3. Chapter 15 - "Desperate Times" Part 1 Food, water, and tempers run short as the survivors look to find a new place to live. Come back Monday October 25th for Part 2! Chapter 14 - "Out of the Ashes" Part 3 Everyone says their last goodbyes. Come back Monday October 18th for Chapter 15! Chapter 14 - "Out of the Ashes" Part 2 Saul's need for medical attention comes to a head as Burt assembles a team to get the bullet out of him. Come back October 4th for Part 3! Chapter 14 - "Out of the Ashes" Part 1 The fallout from the war comes to the surface! Come back September 27th for Part 2! Chapter 13 - "Separate Dying Embers" Part 3 The war continues both in and outside the tower. Come back September 20th for Chapter 14! Chapter 13 - "Separate Dying Embers" Part 2 A Clue left behind sparks a new hope for the survivors. Come back September 6th for Part 3! Chapter 13 - "Separate Dying Embers" Part 1 The survivors are trapped in their fortress, trying to find a way out. Come back August 30th for Part 2! Season 1 Recap Part 2 Part 2 of the Season 1 Recap of "We're Alive" Come back August 23rd 2010 for the Season 2 of We're Alive! Season 1 Recap Part 1 Part 1 of the Season 1 Recap of "We're Alive" Come back August 23rd 2010 for the Season 2 of We're Alive! Chapter 12 - "The War" Part 4 The Season 1 Finale of "We're Alive". Come back August 2010 for the Season 2 of We're Alive! Chapter 12 - "The War" Part 3 The Mallers continue to attack the tower. Come back Monday, April 19th for the final part of the Season Finale! Chapter 12 - "The War" Part 2 The Mallers attack the tower. Come back Monday, April 12th for part 3 of the Season Finale! Chapter 12 - "The War" Part 1 The Tower stands, alone and surrounded. Come back Monday, April 5th for part 2 of the Season Finale! Chapter 11 - "Rest and Recreation" Part 3 In the shadow of disaster, the tower takes some well needed Rest and Rehabilitation. Come back Monday, March 29th for the start of the 4 Part Season Finale! Chapter 11 - "Rest and Recreation" Part 2 The survivors search out the thief as Kalani describes his experience at the other tower. Come back Monday, March 15th for Part 3! Chapter 11 - "Rest and Recreation" Part 1 The rescue team returns to the tower. Come back Monday, March 8th for Part 2! Chapter 10 - "Purgatory" Part 3 The fires are lit in the center of the arena, as the guards return to the prisoners. Come back Monday, March 1st for Chapter 11! Chapter 10 - "Purgatory" Part 2 Behind enemy lines, the team struggles to keep optimism and regain control in what is a hopeless situation. Come back Monday, February 15th for Part 3! Chapter 10 - "Purgatory" Part 1 Deep inside the arena our team gets a first hand look at what goes on inside the lair. Come back Monday, February 8th for Part 2! Chapter 9 - "The Road to Living Death" Part 3 Trapped, with few options, the remainder of the recon team set out to make up for the numerous mistakes made in the mission and head into the home of the zombies. Come back Monday, February 1st for Chapter 10! Chapter 9 - "The Road to Living Death" Part 2 The recon group digs in deep as they approach the source of the trackers. Come back Monday, January 18th for Part 3! Chapter 9 - "The Road to Living Death" Part 1 The mission is continued as planned. The path is littered with obstacles and zombies along the way, but someone or something very peculiar has survived. Come back Monday, January 11th for Part 2! Chapter 8 - "Where Do You Go When You Sleep?" Part 3 The water pumping station reveals something that the survivors would never have expected. Everything starts to fall apart soon after. Come back Monday, December 28th for Chapter 9! Chapter 8 - "Where Do You Go When You Sleep?" Part 2 Utilities start to fail and stage 2 of Michael's plan is underway, and decide to head towards the water pumping plant. Come back Monday, December 14th for Part 3! Chapter 8 - "Where Do You Go When You Sleep?" Part 1 Uninvited visitors show up and stir up problems at the tower. Come back Monday, December 7th for Part 2! We're taking a week off for Thanksgiving. Chapter 7 - "Blood Sweat and Fears" Part 3 Michael's idea of tagging the zombies is underway with unforeseen consequences. Come back Monday, November 23rd for Chapter 8! Chapter 7 - "Blood Sweat and Fears" Part 2 The test continues and the team discovers what happens with their "bait". The come up with a plan to find out where the zombies are all coming from. Come back next Monday, November 9th for Part 3! Chapter 7 - "Blood Sweat and Fears" Part 1 A new plan encourages the group to start developing bait for the zombies. Lizzy devises a plan to go to another rooftop to test her theory. Come back next Monday, November 2nd for Part 2! Chapter 6 - "The Remains of Eastern Bay" Part 3 Saul is discovered as he makes radio contact with the tower. An onslaught of mallers and zombies stalk him as he tries to escape. Come back next Monday, October 26th for Chapter 7! Chapter 6 - "The Remains of Eastern Bay" Part 2 A compromise is made and our team separates. Saul follows the Mallers back to their home to find out some disturbing information. Come back next Monday, October 12th for part 3! Chapter 6 - "The Remains of Eastern Bay" Part 1 The fuel team heads back to the tower with the fuel truck. A couple of other suspicious survivors come in contact with Burt, Lizzy and Saul. Come back next Monday, October 5th for part 2! Chapter 5 - "Lady and the Tink" Part 3 Burt and Lizzy return to the fuel depot to find out what happened to Saul. Come back in two weeks, Monday, September 28th for Chapter 6, The Remains of Eastern Bay! Chapter 5 - "Lady and the Tink" Part 2 Our small detachment of survivors venture to the refueling station. They decide to make a detour to see if Saul's girl survived the attacks. Come back next Monday, September 14th for The Next Part! Chapter 5 - "Lady and the Tink" Part 1 Saul, Lizzy and Burt tell the tale of their mission to the refueling station. Along the way they find remnants of a huge battle. Come back here next Monday, September 7th for The Next Part! Chapter 4 - "Rules and Regulations" Part 3 The events of the past have spurred a new directive: to document everything that happens in a journal. Problems is the tower lead to a small scale revolt. Come back here next Monday, August 31st for The Next Chapter! Chapter 4 - "Rules and Regulations" Part 2 The goals and jobs given to the survivors are starting to be implemented. One of the survivors becomes suddenly ill. Come back here next Monday, August 17th for The Next Chapter! Chapter 4 - "Rules and Regulations" Part 1 The survivors move to retake the tower floor by floor. Dissension starts to grow as Michael establishes a new set of rules for the apartment building. Come back here next Monday, August 10th for The Next Chapter! Chapter 3 - "The New Arrivals" Part 3 Burt, Saul, and Angel meet with Michael and return to the tower to find it under siege. Using supplies from Burt's secret stash, they turn the tides and go to find their friends inside. Come back here next Monday, August 3rd for The Next Chapter! Chapter 3 - "The New Arrivals" Part 2 A slip-up causes the survivors of the tower to be noticed. Michael scrambles to keep everyone safe while Saul and Angel discover a dying old man, Burt, out amongst the ruins. Come back here next Monday, July 20th for The Next Chapter! Chapter 3 - "The New Arrivals" Part 1 Saul and Angel are scavenging for supplies, but are coming up short. A new group of survivors are drawn to Peg's "We're Alive" sign hanging outside the tower. Come back here next Monday, July 13th for The Next Chapter! Chapter 2 - "The Two Things" Part 3 Lizzy, Riley, and Datu are trained to shoot. Pegs struggles to find a purpose as she refuses to use a gun. The other soldiers prepare the hummer for recon missions. Come back here next Monday, July 6th for The Next Chapter! Chapter 2 - "The Two Things" Part 2 Access to the lobby has been lost and needs to be sealed in case more come to the tower for refuge. The rest search the rooms for food and supplies, but find something else living in the tower. Come back here next Monday, June 22nd for part 3! Chapter 2 - "The Two Things" Part 1 The tower lobby is secured, but only for so long. Survivors on the outside try to find refuge in the tower, attracting threats to their front door. Come back here next Monday, June 15th for part 2! Chapter 1 - "It Begins" Part 3 The group searches the apartment building, finding surprises around every corner. Datu, a Filipino maintenance man, describes what happened to the other people in the tower. Chapter 1 - "It Begins" Part 2 Michael, Angel, and Saul travel through downtown LA. They find two female survivors, Riley and Pegs on the roof of a shop, then continue toward an apartment building to hold up in. Chapter 1 - "It Begins" Part 1 The story of survival begins. Michael Cross, 27, watches people attack each other on the way to his Army Reserve Duty station. The situation starts to unravel as he meets up with the other two Soldiers, Saul Tink and Angel Tunudo.